we shared a few strategies for your holiday campaigns and this week we wanted to give you a few optimization tips that you can implement today with your individual holiday strategies. Regardless of your goals, here are three tips about optimizing your Grants account for the holiday season. Your New Year’s resolution doesn’t have to wait until January. As you look back at the year, don’t forget to check in on your keywords and eliminate what’s not working. Then you can also focus on what’s working best. One of the first steps in keyword optimization is to clean up keywords. To remove keywords, I recommend checking out keywords with a low clickthrough rate (CTR) but a high cost. These keywords usually decrease your overall performance. Then try pausing any keywords with a CTR of less than 1.0%, since these keywords are only bringing a few clicks. The holiday season is a good time to highlight specials and to drive additional traffic that is online during these months. Review your current keywords and think of additional terms. This will enable your ads to reach as much qualified traffic as possible. Just like when you paused keywords, you may use CTR as an indicator of a high-performing keyword. Look for keywords that have CTRs above than 1%; this is a great starting point for expansion. Then you may want to use the Keyword Tool to find related keywords to add to an ad group. Another option is to add other relevant keywords with a holiday focus. Since many people are looking to make holiday donations during this time of year, you may want to add donation-specific keywords that still relate to your organization. To improve your ad’s performance, try to make each one as relevant to your keyword list as possible. Think about how this time of year relates to your marketing. If an aspect of your org receives increased attention around the holiday season, try to find a way to touch on that in your ad text. This can help drive more traffic to your site as well as get your message across to users who come across your ad. These tips are great for this time of year, but you can continue to use them in every season. Cleaning up keywords, adding new ones, and revising your ad text help maintain your account’s high-performance. Last week we shared a few strategies for your holiday campaigns and this week we wanted to give you a few optimization tips that you can implement today with your individual holiday strategies. Google Grants accounts have a $1.00 maximum CPC bid. The $1.00 maximum bid is non-negotiable and should be sufficient for most keywords if you are maintaining a high enough click through rate (CTR). High CTRs are usually obtained by choosing highly relevant keywords in conjunction with closely related and engaging ads. Why do we have the limit? Can I bid more? All Google Grants accounts have their bids capped at one dollar ensuring a level playing field for all of the nonprofits in our program. Under no circumstances can this limit be raised, nor is it possible to supplement the $1.00 bid with your own funds in a Google Grants account. The only alternative to using a $1.00 bid is to open a paid AdWords account. For this reason we recommend that Google Grants recipients work to maintain high quality scores and also utilize less common/competitive keywords, which are more relevant to your organization. Why are some of my keywords not generating any traffic? 1. The most common reason that grants recipients will obtain a poor quality score is due to a low click through rate (CTR) and other quality score factors. Essentially, the Google algorithms are designed to show only the most relevant information for each search done on Google. This is because there is a limited amount of space on the search results page and the goal is to provide the user with the best and quickest search experience possible. If a certain keyword/ad combination is not performing well it will earn a low quality score and will rarely show ads. 2. Alternatively, you may be bidding on highly competitive keywords and finding that other advertisers' ads are outperforming your ads. This can happen if you have selected keywords that are very common such as "volunteer" or "donate." Likely, there are thousands of nonprofits that would like to show ads for those terms and only 10-12 ad slots on the first page of Google's search results. Therefore, all other factors being equal, only the top 10-12 best performing ads with the highest quality scores will show. How can give my keywords the best opportunity to succeed within this limit? Optimization is the best way to increase your keyword's performance without increasing your CPC. To learn how to optimize your account, see the Optimization Tips page in our Help Center. If optimization does not help, you may also want to choose less competitive, more specific keywords for your account. From time to time we receive questions about the $1.00 CPC limit within the Google Grants program. Today we are hoping to make this limit, and the reasoning behind the limit, a little more transparent. In Ann Arbor, our team's common goal is to help businesses create and manage advertising accounts that reach new customers. We're thrilled to use our online advertising expertise to help non-profit organizations like yours attract new volunteers, increase donations, serve more clients, and spread your messages. After an application has been reviewed and approved, Google Grants volunteers study your mission, the audiences you want to reach, and your website to write ads and choose keywords that enhance your goals and appeal to your target audience. With a background in the non-profit sector and as an advocate of public service, I was one of the first Google Grants volunteers in the Ann Arbor office. Over the past two years, I've drawn out my colleagues' passion for philanthropy as well and recruited a team of dedicated and enthusiastic volunteers. And I'm proud to say that our office, though modest in size, is robust in its contributions. Over bagels and pizza, our community of volunteers applies our AdWords knowledge to craft just the right ad text to catch the eye of a prospective youth mentor or of a mom looking to adopt a new family pet. And as we do this, we marvel at and are humbled by the wonderful work that you do every day to serve your communities. It's that work, not the tasty treats, that keep us coming back for more. Each month, a group of Googlers gathers in the Ann Arbor office for bagels at breakfast time and pizza at dinner time. We don't come for the food; we're there to build Google Grants AdWords accounts. account to take advantage of the season. Whether you're looking for funding from individuals contributing end-of-year donations or want to promote your organization's holiday programs or merchandise, you should customize your campaigns to meet these goals. Create a brand new campaign with custom, holiday-specific ads and keywords. Be sure to set end dates for your holiday campaigns so that they run only when they're relevant. Customize an existing campaign by adding a custom ad to your existing ad text(s). This can help you test the effectiveness of seasonal ads for your organization. Whether creating a new campaign or adding to an existing campaign, be sure to make your holiday ads and keywords as specific and relevant as possible. Use multi-word keywords that connect your organization's work with the holiday season. For example; 'children's holiday giving', 'holiday clothing drive', or 'Thanksgiving food drive'. Many grantees have had success writing customized ad text and keywords focused on end-of-year giving, holiday programs (including holiday meals or drives), or holiday items for sale, so we recommend that you test these strategies for your own account. More tips will follow next week in Part 2 of this series. Be sure to share your learnings and any new best practices in the Google Grants Help Group. With the holidays fast approaching, now is a great time to maximize your Google Grants account to take advantage of the season. Whether you're looking for funding from individuals contributing end-of-year donations or want to promote your organization's holiday programs or merchandise, you should customize your campaigns to meet these goals. Website Optimizer for Nonprofits, Part 1: What is Website Optimiser? How do you know what to change on your website? We'll answer these questions, as well as get into the specifics of Google Website Optimiser over the course of this series. To begin, let's go over exactly what the Website Optimiser is. Google's website optimiser allows you to effectively measure and test different versions of your website. By making small changes to your websites copy, headline, imagery or even design you can see what changes to your website have the biggest impact on your end goals. One of the best things about the Google Website Optimiser is that its absolutely free. Think about the goals you have for your organization's website and how you might rework your website to better achieve those goals. In particular think of the path a user would generally follow to reach your goal page(s). Is the process clear and straight forward? Are there any areas which could be less ambiguous? Do you and your colleagues agree with how the website is set up? Perhaps you have varying opinions? You can test these opinions and let your website users decide how your pages should be structured. For anyone who has ever had heated discussions with their colleagues / webmaster / boss about web page layout, design or content the Google Website Optimiser might be able to help you end those heated discussions, by letting the user decide what is best. Coming back to goals, so what do we mean by goals and goal pages? Take some time to think about the goals you have for your website and how you'd like to see it improve. We'll continue this series with Part 2: Configuring Website Optimiser for Nonprofits, and you'll see how you can configure Website Optimiser for your goals. Meanwhile, our Seminars for Success program just announced a new series, Website Optimiser Seminars for Success. So, if you're interested in full day, in-person seminars providing hands-on training on Website Optimiser, this may be useful for you. More information can be found on the Seminars for Success site, www.google.com/awseminars. As a non-profit, your website may be the first and last point of contact people have with your organisation. So how do you ensure you are getting the right message across? More importantly how can you improve your website so that it meets it intended purpose more effectively? The answer is Google's Website Optimiser. Let's say you want to see an increase in donations each month through your website. How can you improve these goal conversion rates ? , we found out that there are a growing number of grantees and non-profits using Google Analytics to make the most of their AdWords accounts. This is great news! It means that more of you are able to see what works best for your particular organization's website and what changes you can make to your marketing initiatives to further your org's mission. Something we also discovered in this webinar was that there are a couple of questions common to a majority of Analytics users. So, to get everyone on the same page, we wanted to share those questions and their answers. How do I link my AdWords account to my Analytics account? 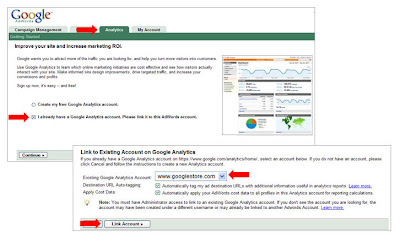 If you already have an analytics account, just follow these steps to link your AdWords account to your Analytics account. Why are numbers in Google Analytics and AdWords sometimes different? There are a variety of reasons why numbers in your AdWords reports might look different than your numbers in Analytics. The two most common reasons for this discrepancy are the difference between the terms you're comparing and the filters active in your AdWords account. First, make sure that you're comparing equivalent items. Google AdWords tracks clicks, while Google Analytics tracks visits. If a user clicks on your ad twice in half an hour without closing his or her browser, this will be registered by Analytics as one visit to your site, even if the user left your site and then returned shortly after. In AdWords, this would be registered as two clicks. Also, AdWords automatically filters certain clicks from your reports, while Analytics will report on the resulting visits to your website. If someone is repeatedly clicking on your ads, AdWords considers this click spam and doesn’t show it in reports or charge you for the clicks, but Analytics will show these visits in your reports. If you want to know more about the differences between how data is shown in AdWords vs Analytics, check out this article for details. We hope you found these answers helpful for managing your own analytics account and we encourage you to bring up similarly vexing questions with the members in the Google Grants Help Group. In a recent webinar, we found out that there are a growing number of grantees and non-profits using Google Analytics to make the most of their AdWords accounts. , free online donation processing with Google Checkout, or by providing a way to geographically tell a group's story with Google Earth Outreach. On Friday, 10/31, Google.org and Google Earth Outreach further supported this last idea by creating a small grants program that will provide non-profits with the knowledge and resources they need to take advantage of powerful and exciting online mapping tools. In addition to helping non-profit organizations like yours operate more effectively, well designed maps can also convey the importance of your cause in a visual, compelling way and give individuals from around the world a chance to experience the work you do. Organizations can now apply online for a "Geo Challenge Grant," valued between US$5,000 and US$100,000, to help make your mapping ideas a reality. Read more about this new program on the Google.org blog and the Geo Challenge Grants website. If you get involved in this program, we welcome you to share your story in the Google Grants Help Group, so that other non-profits can learn from your experiences. At Google, we know that non-profits often have big, creative ideas, but may need a little support to turn those ideas into action. Various programs at Google are designed to help -- whether through free advertising with Google Grants, free online donation processing with Google Checkout, or by providing a way to geographically tell a group's story with Google Earth Outreach. AdWords Seminars for Success are going on through December throughout the country. Check here for information on dates, locations, etc. Check here for information on Seminars for Success. Our resource round-up for November features third party perspective on making the most of your Grant, an example of a new grantee working with an agency and information about the AdWords Seminars for Success happening through the end of the year.